“Dad! It happened again! Shane’s going to die!” Scott yelled as he dropped his backpack in the doorway and ran to his dad. “Whoa, what happened? What are you talking about?” Chris asked putting both hands on his ten year old son’s shoulders. “It was Dominic! I saw him do it! And when he looked at me his eyes changed color again! They were all black! He has green eyes though!” Scott said breathlessly. “Do what?” Chris asked, ignoring the comments on Dominic’s eyes. “During our hiking field trip, I saw Dominic talking to Shane and I overheard Dominic dare Shane to walk across this really old bridge and he did and he fell through it! I tried to stop Shane but he wouldn’t listen! It wasn’t until after Shane fell that I saw a sign that said ‘danger- do not cross’ hidden under some fresh dirt! Dominic must’ve told Sebastian or one of the boys or one of the twins to take it off!” Scott said frantically. “Oh my God, is Shane going to be alright? What a stupid and thoughtless prank!” Chris said angrily. “I don’t know, it looked really bad. There were a lot of rocks down there. I think they said his back was broken!” Scott said. “It sounds like an accident to me,” Chris said. “It’s not, Dad! What about the sign?” Scott protested. “It probably fell off and someone must’ve accidently kicked some dirt on it while walking by it,” Chris rationalized. “But Dad, what about Sara? He was there-” Scott began. “What happened to Sara was an accident. I don’t want you accusing Dominic or any of his friends again. Now go upstairs and do your homework. We can visit Shane this weekend if you’d like,” Chris said, standing straight up and instantly appearing intimidating to Scott. Realizing that he lost this discussion, Scott grabbed his backpack and solemnly walked up the stairs to his room. He shut his door, tossed his backpack on his bed, and flopped into his desk chair. He sighed and slowly opened a drawer. Inside lay a newspaper article cutout that he hesitantly placed in front of him. It pertained to a 9 year old girl named Sara Benson who tripped through an opening in a fence where, on the other side, a baseball game was commencing. As she fell through, a player practicing his swings in the hole accidently swung and hit Sara in the head, causing her to die instantly. Scott knew it was no accident. Lily and Evelyn, identical twin ten year old sisters, invited Sara to play tag that included a safe spot that was the dugout wall. When it was Sara’s turn to be chased, Tristan spilled his ice filled soda in front of the dugout wall ‘safe spot’ causing her to slip and fall through the opening in the fence that just happened to be next to it. Scott was playing at short stop at the time and saw the whole thing. When he told his coach, he didn’t believe him and punished him instead, for lying. He knew Dominic was behind it. Dominic was talking to the girls and Tristan just before they invited Sara to play tag. Scott placed the article gently back into his drawer and pondered when there would be a new article about Shane. “Do you think it was a big enough fall?” Sebastian asked his brother as he cleaned off his dirtied boot. Dominic stood staring out his tree house window. The giant oak tree in their backyard provided much height and branches to secure privacy from all directions. It was a great place to relax in solitude from the walking shells of the lives below them. “Yes. It may be slower than the last one but it’s a sure thing,” Dominic said emotionlessly. “Then why do you not sound happy?” Sebastian asked standing up. Dominic narrowed his eyes in anger as he whirled around to stare at Sebastian and slammed his fist hard into the oaken wall, creating a massive dent. As he pulled his hand away, his skin resembled no impurities from the act. “Because I should not still be here! Ten years was the cut off! Ten years of stealing these pathetic souls! It’s been thirteen! The Beast should have been here to take me home three years ago,” Dominic yelled. He took a deep breath and returned to his calm composure. He turned and looked back out the window. Down below he could see his female, falsely stationed guardian, known as his mother, talking to the twins. His mother offered them peanut butter cookies which they accepted before walking toward the tree house ladder. Before the twins reached the tree house opening, Dominic could see Lance, Cormac, and Tristan entering his backyard, being offered cookies, and then proceed to the tree house ladder as well. He could hear the girls entering and then, a few moments later, the boys. Dominic turned around and was greeted by blank emotionless stares. Cookies were stacked neatly on a table except for Tristan’s who appeared to have already eaten his. Crumbs remained on his shirt but were quickly wiped away as Dominic’s gaze landed upon them. “The mortals are addicted to them for a reason and now I can see why,” Tristan answered. “Indeed, your sin,” Dominic said as he looked back out the window. There was a moment of silence. “Seven deadly sins and seven deadly demons.” The demons nodded as they were reminded of their targets. “What are we planning for your birthday party this weekend?” Lance asked. “A massacre,” Dominic replied immediately. “Our parents?” Cormac asked. Dominic nodded. He gazed across his neighborhood and set it on a two story white house with navy blue trim. He cocked his head slightly and turned back around. “I think we should invite Scott to the party,” Dominic said. Sebastian narrowed his eyes. “He’s suspicious of us though,” Cormac said. “Which is precisely why he should be here,” Dominic said. “Take him out?” Sebastian asked. Dominic nodded again. “They’re supposed to bring an entertainer or something; a surprise,” Dominic muttered in disgust. “Do you think it’ll be the Beast?” Tristan asked. Scott stayed up late on his computer looking for any stories or articles pertaining to color changing eyes and deaths. Unfortunately, colored contacts and random deaths were the only things that popped up. As soon as he finished his homework, he began searching. There had to be something, he thought. He narrowed his search using the keywords ‘child deaths’ and ‘black eyes’. 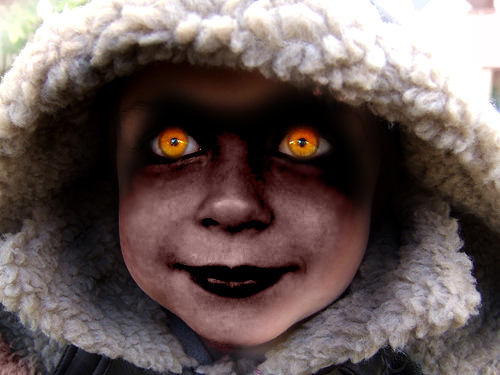 Black eyed dead children came up. He slammed his fist down on his desk, recoiled it in pain, and almost shut the computer off when a drawn picture of solid black eyes on the right side of the screen caught his attention. They looked demonic in nature. He clicked on the picture and an article popped up. It was about a farm family of seven that were burned to death in an accidental fire. The eldest sister and the youngest brother were the only survivors. The eldest sister, Mary Grey, began exclaiming that her brother, Garret, had started the fire and when he did so, his eyes turned black. She was placed in a mental hospital. The picture of the black eyed face was a drawing Mary created to describe what she saw. Scott read that the mental hospital was part of the same hospital Shane was staying at. Completely drowned in the article, Scott instantly jumped at a knock on his door, which was his dad telling him dinner was ready. Scott slept uneasily that night for part of him was anxious to hear the condition of Shane and the other part of him was excited to see Mary Grey; if he could get away with seeing her. The fire happened five years ago but the article made it sound like she was going to be there awhile. The next morning he woke for school, ate breakfast, and took the school bus. Scott sat in an empty seat and stared sleepily out the window. “Hi Scott!” a voice said abruptly. He instantly turned to look at who had spoken his name and blinked repeatedly in surprise. “Hi Rebecca,” Scott said as his heart skipped a beat. “No, it’s not,” he replied quickly moving his Spiderman backpack. She sat down and smiled warmly at him. Wow, Rebecca Platt is talking to me! I didn’t even know she knew I existed! he thought. She looked at his backpack. “Spiderman’s pretty cool but I like Dr. Henry Philip McCoy better. Peter Parker can’t match his genius no matter how much he goes to college and applies himself,” Rebecca said. Scott blinked. I know she just made a Marvel reference, but who the hell is Dr. Henry Philip McCoy? Oh God, I can’t let her think I don’t know! “Uh yeah, I suppose he can’t,” Scott said somewhat lamely. “What’s your least favorite Marvel character?” Her smile broadened. “Oh okay,” Scott said lamely again. He loved The Hulk and Iron Man. “Do you believe in superheroes, Scott?” she asked. Scott was taken aback by the strange question. “Uh, no, they’re not real,” Scott stammered. She laughed. “I don’t mean with super powers. The best parts about these superheroes are that some of them started out as normal human beings, even as kids. They then were landed with heavy responsibilities and decided to do good with them,” Rebecca said. “And fight evil,” Scott added. She laughed again. “Exactly,” Rebecca said as she got up to exit the bus. He didn’t even realize it stopped. “Yes?” she said, turning to look at him. “How would you fight evil? I mean because, you know, we don’t have any superpowers?” Scott asked. “I wouldn’t give them what they wanted,” she said simply. “Refresh your knowledge on Dr. McCoy tonight, he may help you out,” she said. Scott was confused. “Help me with what?” he asked but it was too late. She was out the door. He tried to follow but he lost her. Instead he ran into his friend Chad. “Hey, I heard you saw what happened to Shane! Is it true that his whole body was mutilated?” Chad asked. “What? No, but he looked pretty bad,” Scott said, still looking around for Rebecca. “What are you looking for?” Chad asked annoyed. “She said something to me that I didn’t understand,” Scott said. Chad placed his hand on Scott’s chest to stop him from moving. “Yeah right Rebecca spoke to you. She doesn’t even know we exist, man,” Chad laughed. “Maybe not you,” Scott snickered. Chad hit him in the shoulder as they both entered the classroom. The class became abruptly quiet and all eyes turned on him. Classes commenced with an excited buzz spreading about Scott, Shane, and Dominic and the accident throughout the school and in every classroom Scott entered. It wasn’t until after school and on the bus did he encounter something else to spark more rumors. He sat in an empty seat and stared out the window. “Hi Scott,” came another voice. His heart raised and as he turned around, expecting Rebecca, but instead, he saw Lily, Evelyn, and Tristan. The three smiled and took the seats behind him. Sebastian, Lance, and Cormac took the seats in front of him and they each turned to face him. Dominic came closer down the aisle and stood in front of the empty seat next to Scott. “Yes, by Spiderman as you can see,” Scott said. Dominic raised his eyebrows, looked at the three boys in front of Scott, and laughed. With two fingers, he knocked the Spiderman backpack to the ground and sat down next to Scott. “Looks like the hero’s fallen,” Dominic remarked, smirking. “What do you want, Dominic,” Scott asked, annoyed. “I wish to cordially invite you to my birthday party, tomorrow at 5pm,” Dominic said as he handed Scott an invitation. Scott did not accept it. “I’m not going,” Scott said immediately. Dominic smirked. He picked up Scott’s backpack, opened it, slid the invitation inside, zipped it up, and set it gently back on the seat. The rest of Dominic’s gang got up, said goodbye to him, and left. Scott sat staring at his backpack until the bus stopped once more. “Hey Scotty, Dominic’s mom called. She says that we’re invited to his birthday party tomorrow,” Chris said, as he continued to wash the dishes. “Dad, I don’t want to go!” Scott protested. “It would be nice to go and show that you have no ill intent toward their son. I mean he was nice enough to invite you, right?” Chris asked. “Dad, he hates me! And I hate him!” Scott said. Chris placed a dish down and walked toward Scott, his face stern. “We’re going. After you finish your lunch, I made sandwiches, we can get him a gift and then go see Shane,” Chris said, indicating a roasted turkey and provolone cheese sandwich. Scott’s stomach growled as he saw it and instantly sat down to eat. He never won arguments. Scott had no idea what Dominic liked besides hurting people so he hoped that a Hulk action figure sufficed. After leaving the store, they headed straight for the hospital. Shane was in a deep sleep as a morphine drip flowed through him. The doctor said that he had broken his back and that he would be paralyzed for the rest of his life. When Scott bluntly asked how long that would be, the doctor gave no answer. Chris left Scott to get some drinks in the cafeteria four floors below them, giving Scott the opportunity to find Mary in the psyche ward. To his surprise, by telling them that he was a friend and that his dad would be coming shortly, he was let in. Mary sat at the window gazing at the landscape below. “Mary Grey?” Scott asked shyly. The girl turned around and looked at him. “Hello. Do I know you?” she asked. “Um no. My name is Scott Benson and I was wondering, uh, if you could tell me about what happened to you?” Scott stammered. Mary was now twenty years old yet looked almost the same as the fifteen year old picture of her in the newspaper. “Why?” she asked, narrowing her eyes. Scott waited for this question and though he prepared the answer, it was still hard for him. He took a deep breath. Mary’s eyes widened. “Are you sure?” she asked. “It’s happened twice already. The same kid. I’ve seen it both times but no one will listen to me,” Scott said. “You should be glad they don’t. They’ll think you’re crazy like me,” Mary said, sitting him down next to her. “Please help me, Mary. I don’t know what to do. What is he?” Scott asked. Mary closed her eyes and took a deep breath. “I asked my brother the same thing. He came to visit me here one day a year afterwards and I asked what he was. Well he wasn’t my brother, that’s for sure. He said he was a demon sent here to observe us and take souls back home. Home, I’m assuming, could only mean Hell. He said that every demon sent here has a specific target. His, was families and after ten years of collecting, he said something called the Beast would come and take him home. Apparently they’re stuck here in human form until the Beast comes. After Garret told me this, he tried to kill me. He pinned me down, a six year old, and slashed my wrists! He made it look like I did it. I was dead for three minutes until I was revived and later placed on suicide watch,” Mary said, showing her vertically scarred wrists. Scott cringed at the sight and suddenly felt like he was going to throw up. “Wow,” was all Scott could say. “Scott! What the hell are you doing in here?! One of the nurses told me they saw you come down here but I didn’t believe it,” Chris said sternly as he stormed toward Scott. Scott jumped up and looked at his dad. “He was looking for you and got lost. I was just giving him directions when you showed up,” Mary said, smiling at Chris. Chris raised an eyebrow. “And you decided to go to the psyche ward to ask for directions. Right, let’s go,” Chris said, grabbing Scott’s arm. Scott looked back at Mary, who gave him a solemn look, before they exited the building. After a silent dinner with a tension filled atmosphere between Scott and his dad, Scott took a shower and then typed in Dr. Henry Philip McCoy into the search engine. He jumped and nearly fell out of his chair when cartoon images of Marvel’s character the Beast showed up. Scott was unable to look away from the furry blue mutant as he thought over what Rebecca and Mary had said. Rebecca made a point of mentioning envy, anger, and pride, Dominic also mentioned anger, and then she pushed me to look into the Beast which is the same term Mary used to describe what her brother sought after, Scott thought. Does Rebecca know about Dominic? He continued to read up on everything he could about Dr. McCoy and his beast counterpart but nothing seemed to stick out to him. He did not even realize he fell asleep at his desk until his dad woke him up for breakfast the next morning. As his eyes hazily opened, he tried to recall a strange dream he had of his deceased mother, Rose, trying to tell him something. Scott had a strange feeling that it was important. After breakfast, he went upstairs and went straight to a bookshelf to pull out a small unfinished scrapbook his mom made for him. He collapsed on his bed and gently flipped through it. Rose Moore accidently drowned in the bath tub two years ago when she slipped, hit her head on the wall, and unconsciously fell in. No one else was home. Scott was sleeping over at Chad’s house across the street and Chris was still at work. Scott found her when he made a trip home to get his sleeping bag that he had forgotten. His dad had just gotten home when he heard Scott yell. Scott remembered how she loved the scent of orchids and would always smell like them. He remembered how when he was little, he would always play with her spiral copper curls and giggled when they bounced back into place. There were plenty of pictures depicting that scene in his scrapbook. He also remembered that both those things vanished when he saw her floating face up under the surface. Her scent was almost equal to that of the smell a garbage disposal emits when it stops working and collects all the leftover food. Her cooper curls were dark and reached across the water like clawed tentacles reaching for unsuspecting victims. He was tired of seeing death. He looked through the pages and found what he was looking for. Scott sat at an old ornate dining table surrounded by seven demonic children and their parents. Dominic had already opened his insane amount of gifts and seemed to be uninterested in each and every one including a hundred dollar bill, a PS3, and a new laptop. When he opened Scott’s present he raised an eyebrow and smirked at Scott. When the lights turned off for the cake candle blowing, an icy shiver ran through Scott’s back and he wondered if he would be the next Shane, Sara, or Mary. A match ignited the thirteen candles on top and though it should’ve given a sense of peaceful ambiance, the lit candles seemed to mirror that of a raging inferno. Dominic grinned across the table at Scott and he soon realized that the other six children turned to grin at him as well. Scott narrowed his eyes and looked around him. Dominic blew out the candles and it went dark. Scott could feel Cormac and Lance on either side of him grab both his arms but a thunderous knock on the front door startled them and caused them to let go. “Oh my!” Scott could hear Dominic’s mother say. He heard her fumble to the door. “It seems like the power’s out,” she mumbled. She opened the door. “Oh hi! You must be our entertainer!” she exclaimed in delight. The table was silent as everyone looked toward their new visitor. The light from the street and the visible moon and stars gave off the only light in the now darkened room. The figure was tall with long blonde hair tied in a ponytail. His face was painted white with black diamonds under his eyes. He had a Hello My Name Is sticker on his left peck with a huge blue G written on it. He smiled broadly and nodded yet said nothing. “Oh come in, come in! The lights seem to be out so leave the door open. Look honey, the entertainer’s here!” she exclaimed to Dominic. Dominic grinned and stood up. “Welcome my friend. The party can finally start,” Dominic said. Lance and Cormac grabbed Scott and tried to pin him down to the table as the other children attacked the rest of the party. “Stop! Dad, help!” Scott yelled. There was no answer. Screams echoed from the kitchen and then fell silent. Adrenaline rushed through Scott and he threw Cormac off of him and kicked Lance square in the stomach. Scott ran for the kitchen and skidded across the blood pooled floor. Bodies of family members littered the once white tiles with disassembled pieces everywhere. Scott swallowed the scream that was dying to escape as Cormac and Lance came into the room after him. They exchanged pleasurable looks and turned there now pitch black eyes on him. “You can’t win, Scotty. The Beast is here and we’re all going home. You should come with us. There are plenty of riches down there,” Lance enticed. “It’ll be a place where you can rest forever,” Cormac said as they both slowly walked towards him. Scott gingerly stepped back and was careful not to step on so many pieces. Riches, rest, Scott thought. Scott hesitantly took out a dollar bill from his pocket and ripped it in half. Lance slowly tilted his head to the side and twitched ever so slightly. Scott dug deep into his pockets and splattered coins all over the floor and stomped on them. Lance’s mouth opened slightly showing tiny sharp teeth as he gazed in shock at Scott’s actions. Cormac looked in confusion at Lance. Scott, without hesitation, pulled out a hundred dollar bill he’d been saving for years from his pocket. Lance’s eyes immediately fixated on the bill like a hawks and then looked into Scott dead in the eyes. “What are you going to do?” Lance asked, his voice a cold harsh whisper. Scott began to rip it. “NO!” Lance yelled as he leaped at Scott, claws replacing fingernails. Once the bill was torn to pieces so was Lance. Lance let out a howling scream as he was ripped apart from the inside and his flesh exploded into ash in midair. Scott gasped and covered his face. Cormac let out a surprised yell and turned his gaze back to Scott. Scott looked at Cormac’s deranged expression and ran. He jumped over the massacre and dodged pieces until he threw open the other door and flew up the stairs. He could hear Cormac behind him but once Scott picked up speed, that same howling emerged from Cormac’s lungs and he exploded to ash as well. He could not believe it was working. When his mother came to him in that dream, he’d almost forgotten what she told him. Then a trigger reminded him that she told him that they wanted his weaknesses so he needed to give them his strengths. Coming up to a platform, he was greeted by the twins. “Hi, Scotty,” Lily said, as she smirked and winked at him. “You think you’re something by killing two of us? I’ve killed hundreds and will continue to do so for my prince,” Evelyn said stepping toward him. Scott swallowed and slowly bowed. “Then I congratulate you on your work. You are obviously my superior,” Scott said quickly. Evelyn twitched and placed her hand on her chest in pain. Scott took a knee. “I am not worthy to challenge such a force and I yield,” Scott said. Her scream echoed and smoldered cinders littered the platform. Lily gasped and jumped on top of him. “Kiss me,” she said, moving closer to him. He turned his head away and closed his eyes tightly. Another scream, another pile of ash. Scott jumped up, wiped the ash from his body and continued up the stairs to a hallway. Before he saw anything, Sebastian slammed him against a wall and began to claw through his shirt and into his stomach. Scott screamed. “I want your soul! Your kind aren’t worthy of them!” Sebastian screamed. “Take…what…you need. I’m… not envious of you,” Scott said through gasps of blood. Sebastian barred his fangs in anger as he understood that it was over for him. “No. NO!” Sebastian growled as he disintegrated. Scott slid down the wall and collapsed against it. He clutched the deep gashes in his stomach and gazed straight ahead. He could hear over the throbbing in his head an excited growl. Scott shifted his gaze to the doorway he was next to and saw Tristan hungrily coming closer to him. Tristan got on his knees and reached through a gash and gripped something from the inside of Scott’s stomach. Scott let out another ear splitting scream as he could only imagine it was an intense. “You smell so good. Better than cookies, better than cake. Would you like some cake, Scott?” Tristan asked. Shakily yet as quickly as he could, Scott reached in his other pocket and pulled out a small bottle of holy water. Tristan growled and tried to rip his intestines out before Scott placed it to Tristan lips but Scott beat him and watched another ash cloud fill the room. Scott dropped the bottle and felt his eye lids grow heavy. He heard feet shuffling and felt two hands press against his stomach. A warm sensation instantly flowed through him and he flashed his eyes open. The pain was gone and so were the gashes. Scott looked around but saw no one. He was terrified to get up but superheroes never backed down from a fight. A feeling more than anything pulled him toward the attic. Once he entered, Dominic waited for him with his dad lying in a pool of blood in the center of the room. “No! Dad!” Scott yelled racing to him. Chris faced away from Scott but his eyes were situated neatly against the back of his skull. Scott screamed and jumped up in shock. Dominic grabbed him by the base of his chin and neck and held him up. “Does this make you angry, Scott? Does it make you angry that I’ve still won and your daddy is dead?” Dominic roared. Scott could feel Dominic’s hand begin to crush his jaw. Tears finally streamed down Scott’s cheeks. “It looks like the hero’s fallen. Just tell me and the pain will stop.” The door to the attic swung open and the Entertainer walked in. He looked from Scott to Dominic to Chris. “Almost done,” Dominic said, turning back to Scott. Dominic readjusted his grip so that Scott could speak. Scott coughed as he gasped for more air. Scott slowly grabbed the bottle of water from his pocket. “I forgive you,” he said, flipping the cap open and pouring it on Dominic’s face. Dominic yelled and dropped Scott. Scott backed up and watched Dominic’s flesh melt off his face. “Holy water!” Dominic yelled. Scott’s mother had kept a bottle of holy water from Scott’s baptism in the scrapbook in a built in pocket. “Beast! Take me home now!” Dominic screamed as his flesh began to tear off his body. The Entertainer narrowed his eyes and walked toward Dominic. A strange and eerie cackle emerged from Dominic’s lips. The Entertainer lightly pressed his black gloved fingertips into Dominic’s chest. He stopped cackling. “What are you doing? No. Stop! You’re not the-” With a little more pressure, the Entertainer shattered Dominic. His ashes scattered across the room with his scream echoing in his wake. Scott’s chest dipped and rose as he exhaled sharp heavy gasps. Warm tears continued to stream down his cheeks. He gazed at the Entertainer who began to walk toward him. As he did so, Scott immediately noticed his dad twitch and get up. Scott’s mouth dropped open in shock as he gazed in horror at his dad’s eyeless form jump onto the Entertainer’s back. The Entertainer grabbed his head from behind and slammed him onto the floor. Chris jumped up and they both took a step back as they planned their next move. Dad. He was the Beast, Scott thought. He killed Mom. He said he just got home but he had been there. I never heard the car pull up. He hid when I got home. Scott saw white wings thrashing. He took a closer look at the Entertainer but there were none. Scott blinked and realized that the reflection of the Entertainer from the pool of the blood depicted him with flailing blonde hair, fair skin, and long bright white feathered wings. His name tag also read Gabrielle in blue letters. He looked back at the real Entertainer and did not see any of those things. His hair was still in a ponytail, his face paint was still on, and he had no wings. Scott looked back at the reflection and looked at his dad. What reflected from the red surface was not his dad and neither was it the blue mild mannered doctor from the Marvel cartoons he used to watch. In its place was something more hideous than an eyeless man coming back to life. Solid muscles bulged from his black hairy form. Elongated arms reached past his knees with fingers double the length of a humans and yellow claws that tore easily through the Entertainer’s flesh. Scott previously wondered why crazy people were often referred to as people who snapped but now his question was put to rest. As he gazed at the reflection of two supreme beings fighting in two different worlds, he could swear he heard the resounding snap in his head and then a peaceful silence as the Beast lay dead in both the reflection and real life. The Entertainer or Gabrielle smiled warmly and knelt in front of him. “I didn’t give them what they wanted,” Scott muttered. Gabrielle smiled and nodded. Scott weakly smiled back as he suddenly smelled a strong scent of orchids. Letters I’ve Written . . .